Without a specific Salesforce ID configuration within 8x8 Account Manager, a Salesforce ID error should occur. 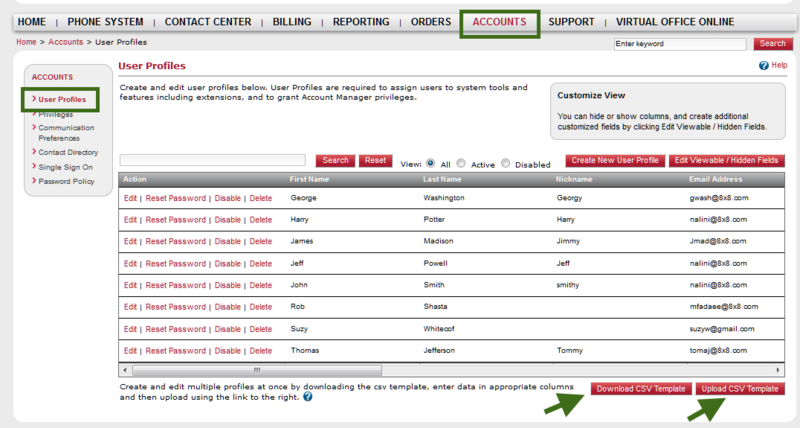 Log in to 8x8 Account Manager. From the Login drop-down menu, select Account Manager. Next to the desired user profile, click Edit. Add the user's Salesforce username to the Salesforce ID field, such as <[email protected]>. Note: If you have created a new user profile, be sure to assign the profile to an extension and log in to it before downloading the application. To upload multiple Salesforce usernames, you can download the CSV template from Account Manager, then update it with the Salesforce usernames and upload it. Open the CSV template file using Microsoft Excel. Add the Salesforce usernames of all desired users to the Salesforce ID field, and save the template file. From the User Profiles page in Account Manager, click Upload CSV Template. Click Add, and select the file you saved earlier.